There are things which are worth having time for. This hotel in Bakony is an ideal place to enjoy a range of wellness programmes. From spring until late autumn our guests’ favourite place of recreation is the hotel park. There are two clay tennis courts, an outdoor swimming pool as well as deckchairs to have some cooling refreshments in the hottest days of the year. There is a wood playground next to the tennis courts (climbing tower, swing, sandpit, seesaw, revolving drum, giant garden chess, outdoor bowling) furthermore, there is a mini golf course awaiting the children. 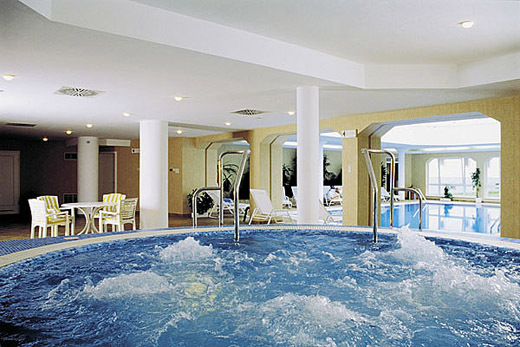 Our spacious and light indoor swimming pool is open between 7.00 a.m. and 11.00 p.m. throughout the year. The pool is equipped with a counter swim unit. There is also a bubble bath at 36°C, a sauna, an infrared sauna, a solarium, a fitness room with cardio equipment. In the massage room under the swimming pool level our staff awaits the visitors with a wide range of services. There is also a table tennis in the corner for those who feel fit enough to work out in a playful way.